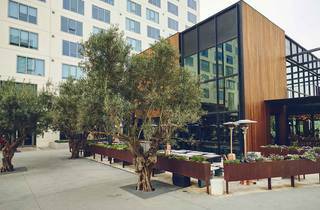 Otium, the Broad's upscale restaurant, is a reflection of its neighboring museum: flashy, fun and filled with pricey pieces of (culinary) work. One of my favorite museum restaurants—though you could hardly call it a restaurant—is the cafeteria at the National Museum of the American Indian in Washington, D.C. Visitors shuffle into Mitsitam Café’s self-service line, piling blue cornbread, cedar plank salmon, bison and wild rice on to their plates. 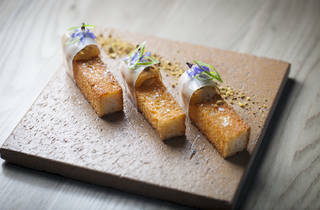 Not only is the food, for the most part, quite good, but the cooking reflects indigenous ingredients and techniques from the Western hemisphere, a culinary experience that effortlessly connects what museum goers are about to eat with the artwork and history around them. 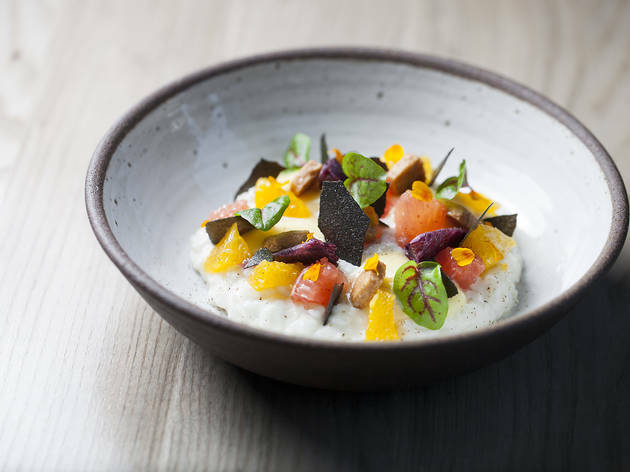 While Otium could hardly be compared to a cafeteria, the upscale restaurant from chef Timothy Hollingsworth (Barrel & Ashes, The French Laundry) is also a close reflection of its neighboring museum, the Broad. The two opened a couple months apart, and while they are physically separated, they share the same stature, hype and contemporary aesthetic. 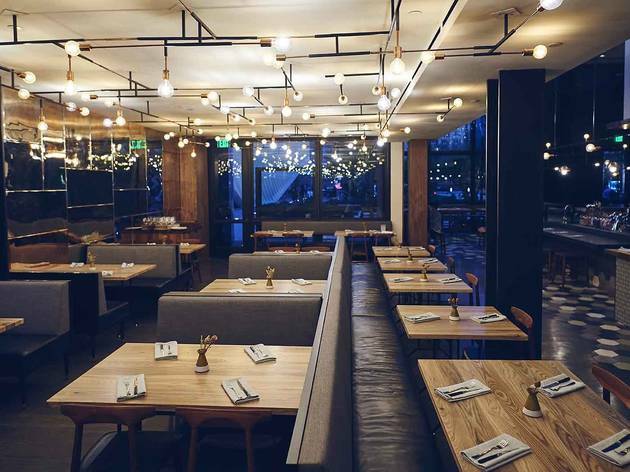 Otium is a beautiful space filled with beautiful lighting, including an overhead fixture that closely resembles the twinkling lights of Yayoi Kusama's "Infinity Mirrored Room." 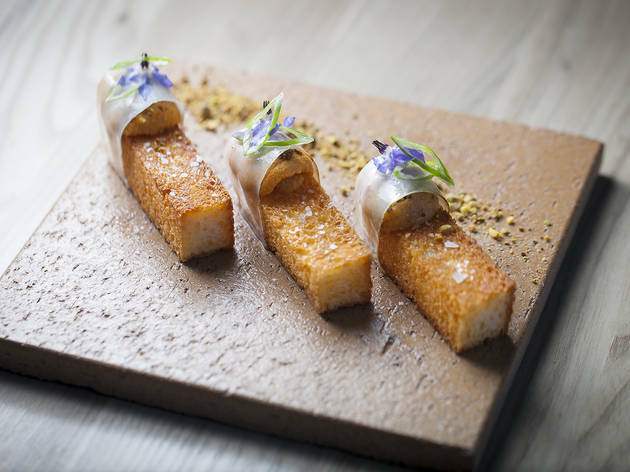 There are beautiful plates, too, some as delightful as they are visually appealing: sea urchin and lardo on buttery sticks of brioche, topped with pistachios and a drizzle of truffle butter in one of the most decadent iterations of a breadstick. I just wish there were more of them—the sticks of brioche are quite small, as are the four fried falafel balls arranged on one side of a large plate like Donald Sultan’s “Streetlight” at the Broad, a lopsided canvas of content. 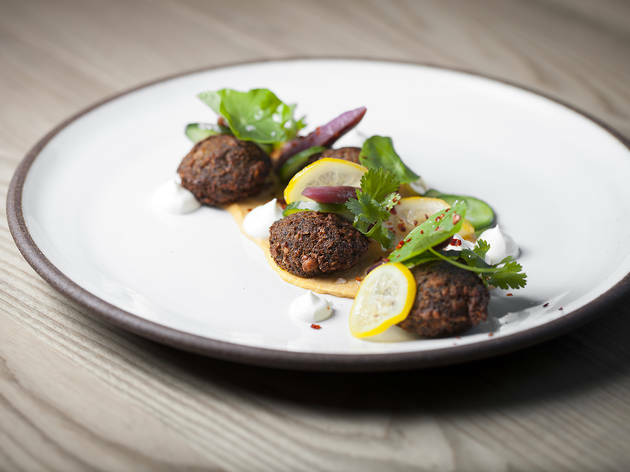 The falafel is bulked up with eggplant, cucumber and chickpea puree, but despite enjoying each bite, I couldn't help but wonder if something had been left out. 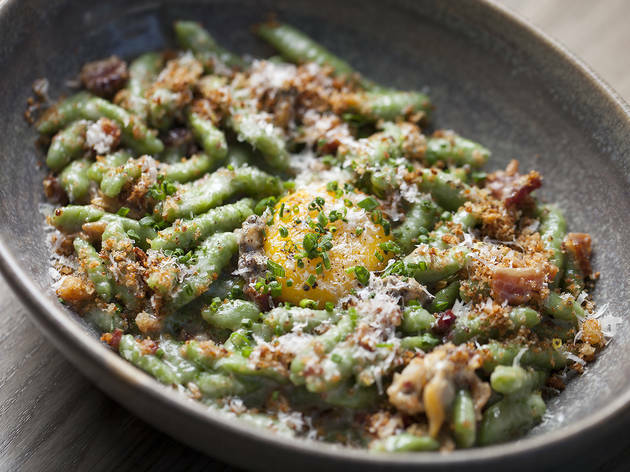 Our favorite dish—and, apparently, Instagram's favorite dish, too—was the spinach bucatini, tangled and clinging to a savory bacon and clam cream sauce. 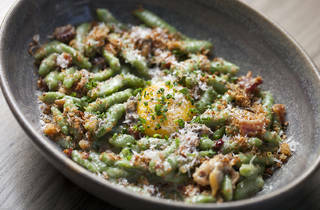 A gently poached egg serves as the cherry on top; broken and tossed with the pasta, it makes the bucatini slip around the plate as you try to scoop up every mesmerizing bite. I wish the duck breast (all four, slender slices) had been as delightful, but they were tough and just OK—a shame considering the plate came with a $40 price tag. 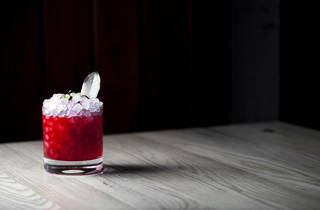 It’s better to spend that money on a couple of fantastic cocktails, which Otium has in spades. Skip the riz au lait, a light but fairly plain dessert garnished with citrus and black sesame, and instead treat yourself to the roasted banana daiquiri made with an Otium rum blend, lime olio saccarum and cacao nibs. 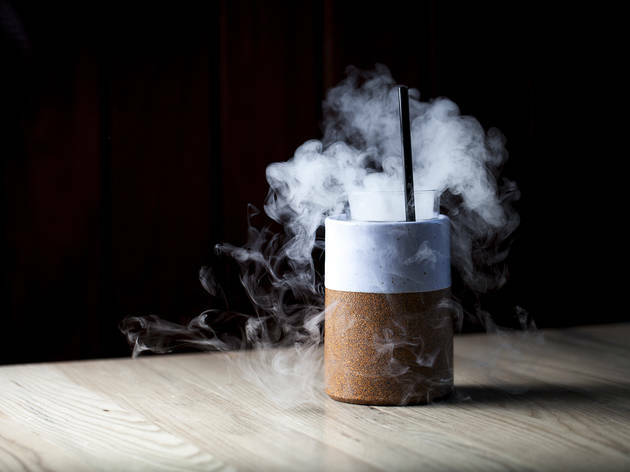 A ball of dry ice causes the drink to smoke seductively from its ceramic container. 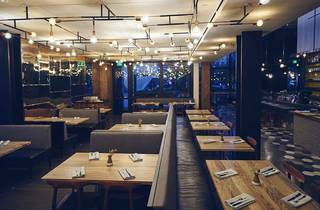 It’s flashy and fun, which could sum up the Otium experience as a whole. Is it worth the price? I guess, like the collection of art next door, that’s up for interpretation. 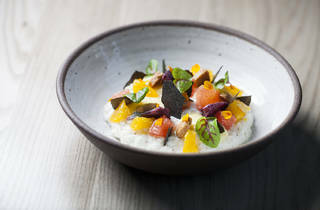 What to Eat: The sea urchin brioche ($18). 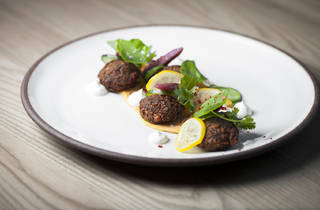 The falafel ($16). The spinach bucatini ($22). 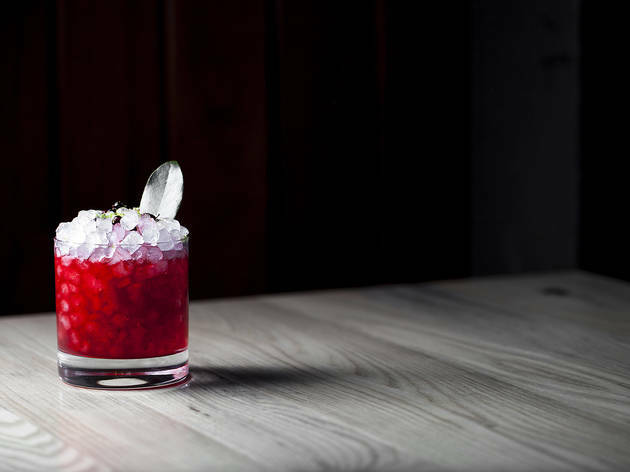 What to Drink: In addition to the aforementioned daiquiri, Otium has exceptional cocktails that make it a worthwhile drinking destination. 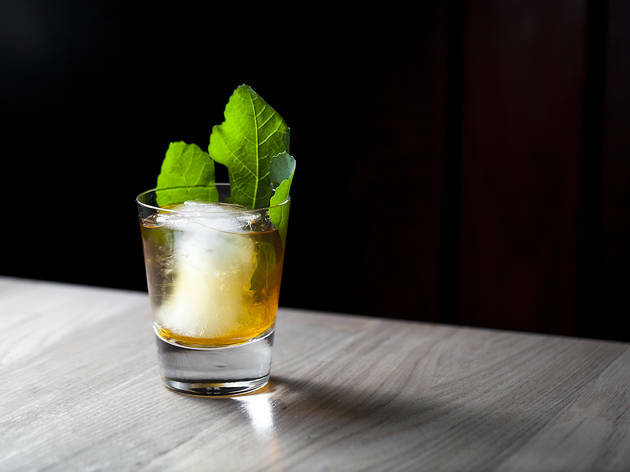 The Crabapple ($14) uses chamomile, verjus, honey and VSOP for a smooth, aromatic finish, while the Celery Rye ($15) is a more savory pick. 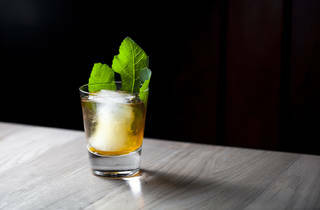 Rye, maraschino and dry vermouth are combined to offer a strong kick—have a couple of these and you'll be splayed out on the Broad's lawn in no time. Where to Sit: It all depends on whether you’ve made a reservation (and you should absolutely make a reservation). Tables fill up quickly but offer the most intimate experience. 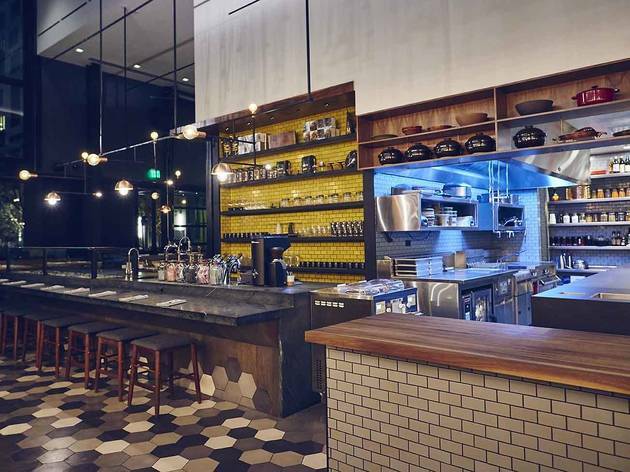 Walk in on a whim and you will probably find yourself sitting at the chef’s counter, where service can be hit-or-miss. Just here for a drink? 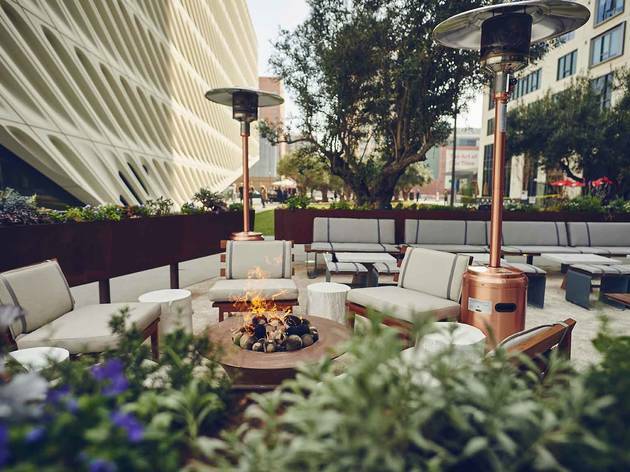 The patio dotted with fire pits is your best option, even if it’s for the view of the illuminated Broad alone. I admittedly haven't had dinner here, only brunch. That said, I wasn't impressed with the food at all—in fact I found my frittata pretty unappetizing. But the setting here absolutely lovely. If Otium was a more casual spot, this would be the most incredible place to just enjoy a cup of tea while looking out onto the Broad's grove of olive trees. Beautiful ambiance and lovely staff. The brunch menu is fantastic. I highly recommended their crispy potato dish and hummus dips as well as their mole dish and hoe cake! delicious! I've only been here for drinks so far, but they were terrific. 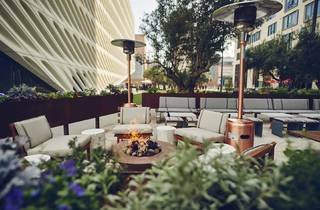 I loved being able to sit outside and enjoy the views of The Broad and even on a chilly day the fireplaces and heat lamps will keep you warm. I'll definitely be back here. Been here a few times and I immediately loved it! The space is simply gorgeous! They have the best Old Fashioned, and the Roasted Banana is also an experience. The food here is intended to be shared – which is a cool thing in a restaurant like this.The portions are just enough to go around and since all the ingredients are so well blended, you really appreciate the flavours. Since it's a busy place, sometimes the waitress can get a bit confused, yet they compensate with politeness. 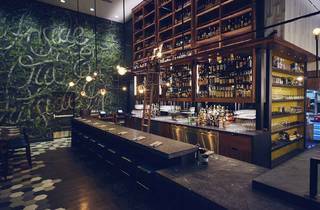 Be sure to make a reservation, otherwise, the option of dining at the bar is also very nice. 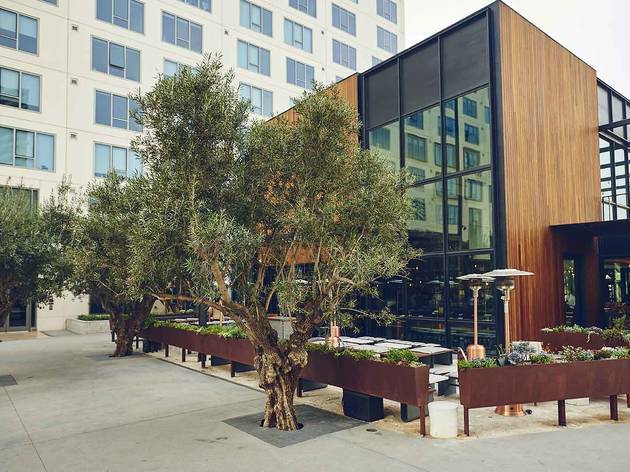 Otium should be just as much a necessity to visit while in LA as visiting The Broad. This is one of those rare restaurants where it's difficult to tell if the architecture matches the food or the food matches the architecture. It is both visually stunning to sit in this restaurant as it is to taste the food. 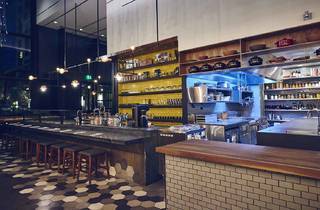 This is my new favorite restaurant in DTLA! I recently went for drinks and sat outside, which was beautiful! You get a view of The Broad museum while you sip on your cocktails, perfect evening! The service was really great and I can't wait to go back to try the food. This is such a beautiful space (aside from the bar wall covered in a cheesy leaf graphic—the one stain on an otherwise lovely design), and if you can't afford to have a full dinner here, I suggest ordering a cocktail (the Crabapple is delicious) and sitting on the outdoor patio near the fire, with the Broad as your back drop. 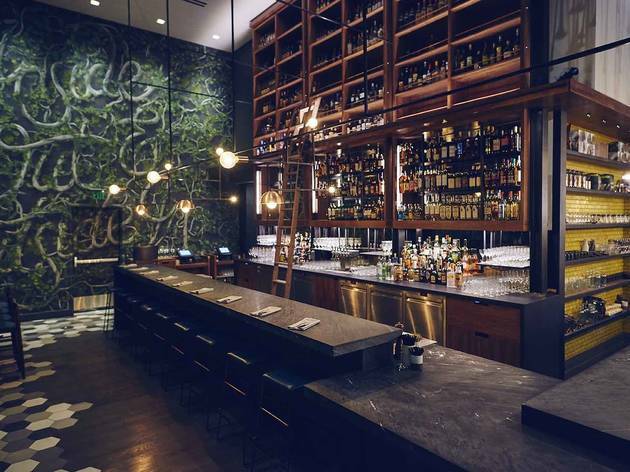 If you do dine in, be sure to try the falafel and the spinach bucatini.